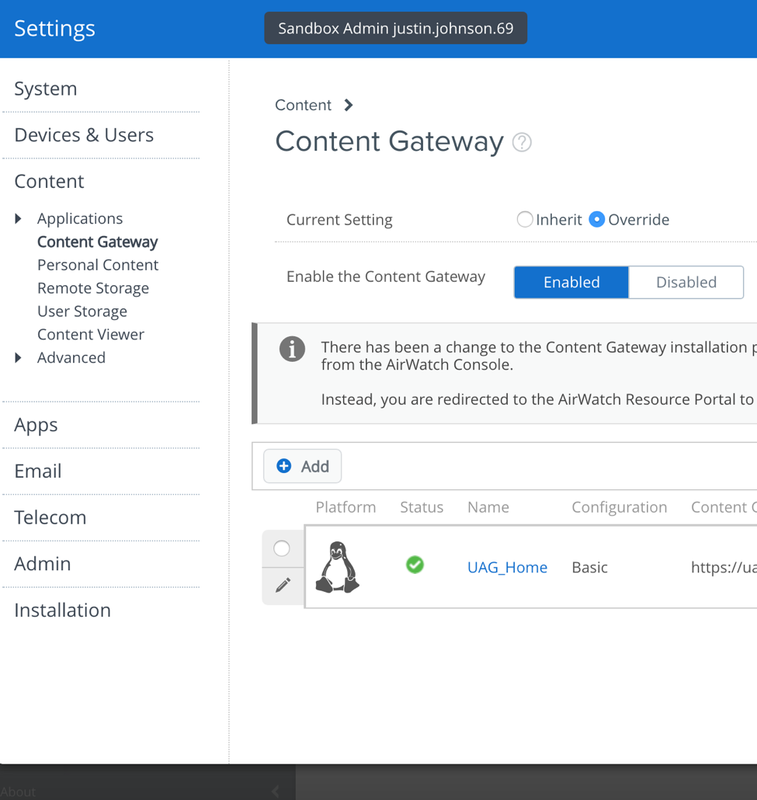 The first step is to configure a content gateway node from the Workspace One UEM Console. 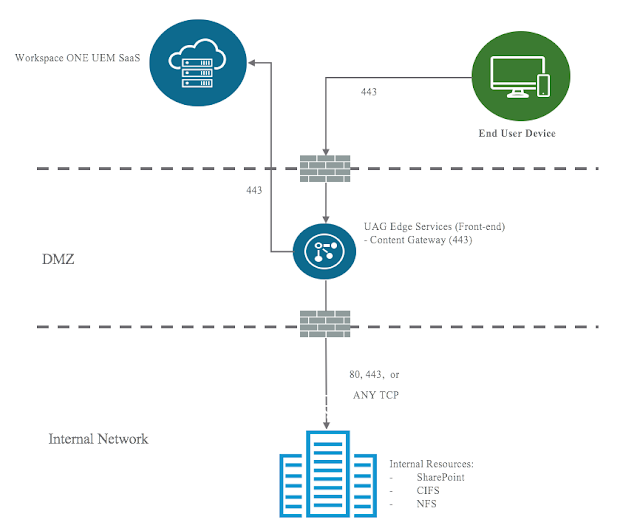 (Workspace One UEM is the artist formerly known as AirWatch.) Then you deploy UAG and configure it through the Content Gateway edge services settings. Once that's successfully completed you can begin to configure access to the CIFS share through the creation of an admin repository. 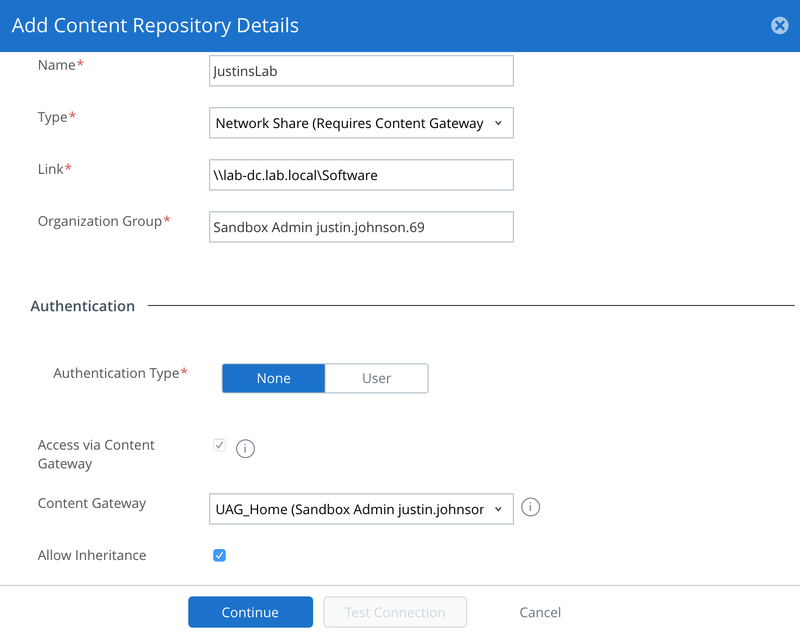 This admin repository is then accessed by remote users from within Content Locker, with UAG acting as a gateway between these external users and this admin repository sitting within the trusted network. So, you'll definitely need a Workspace One UEM (AirWatch) instance. 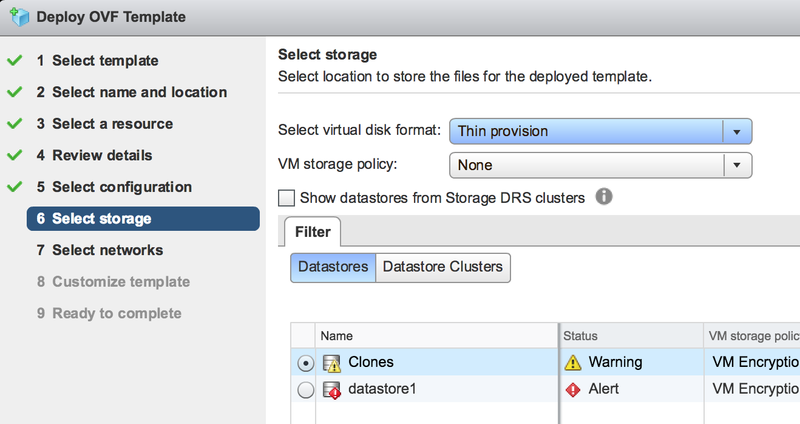 For this post I leveraged a free eval Workspace One UEM instance at vmwdemo.com. You're certainly going to need a UAG appliance that's externally accessible over port 443. The UAG appliance itself, in Basic mode, will need access to port 445 on whatever server your CIFS share is set up on. 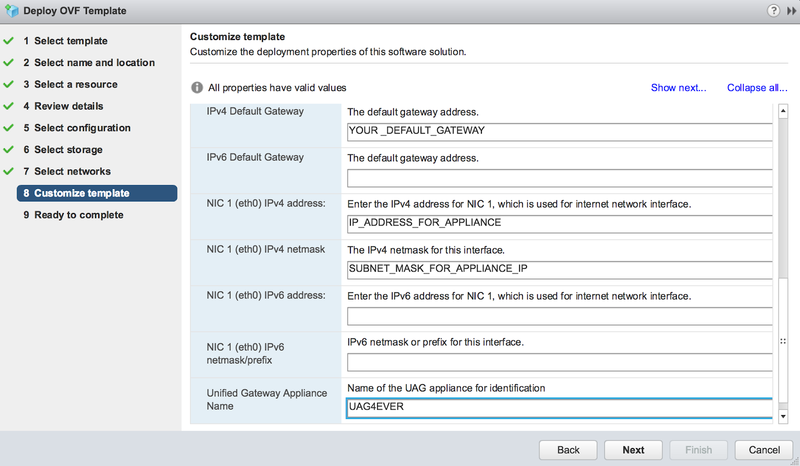 The UAG appliance must have a DNS address that resolves to a an accessible IP address. Finally, you'll need a valid public SSL cert on the UAG appliance. On the Workspace One UEM Console go to Groups And Settings --> All Settings --> Content --> Content Gateway. There you'll have an option to enable Content Gateway and add a Content Gateway node. Select Linux as the installation type. 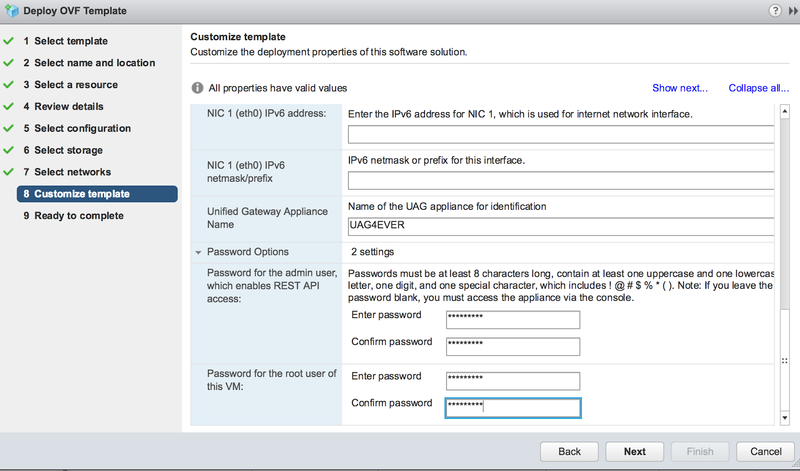 Enter in a descriptive name and provide the publicly resolvable DNS address of your UAG appliance. Finally, upload the pfx SSL certificate for your appliance by clicking the upload button. After successful completion you'll see the new instance show up under Content Gateway. Of particular interest is the GUID for this instance that's visible when you scroll to the right. 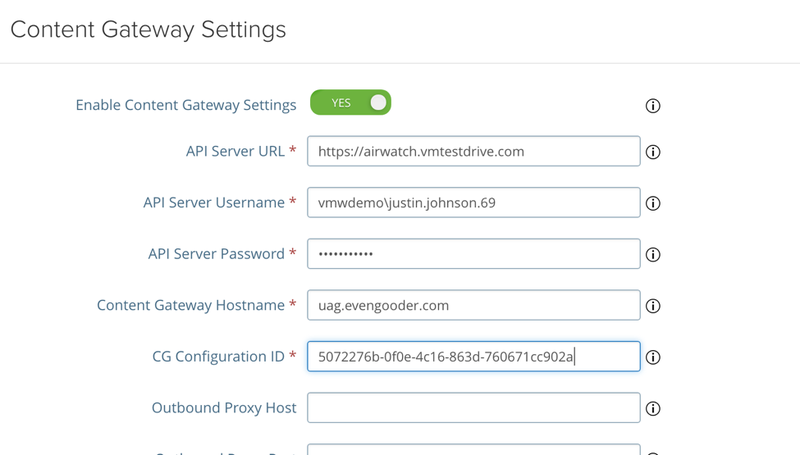 We'll later use this info when we configure the Content Gateway settings on the UAG appliance. 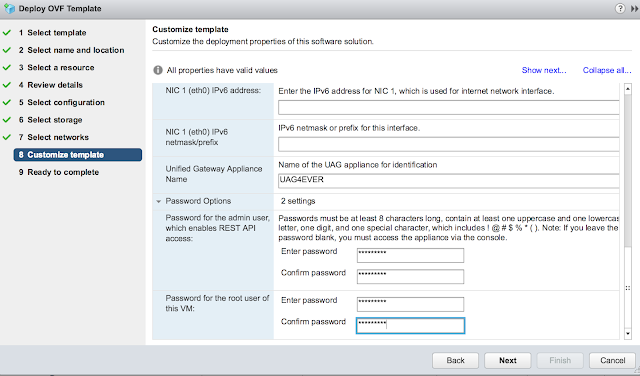 The simplest way to initially deploy and configure UAG is through the vSphere Web Client OVF deployment wizard and the gui on the UAG appliance itself. 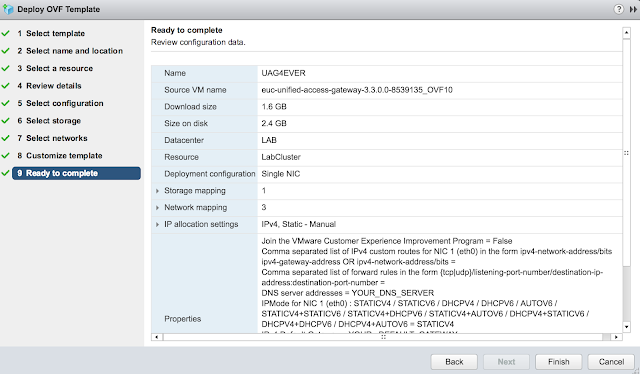 You can download the UAG 3.3 appliance here from My VMware. After downloading the UAG appliance fire up the vSphere Web Client and launch the Deploy OVF Template wizard. When prompted browse to the UAG ova download and click next. 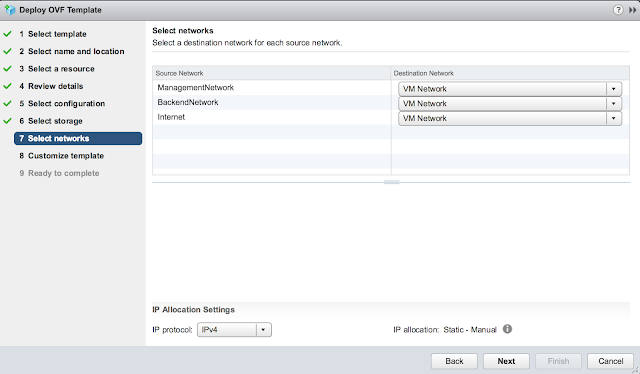 Provide a VM name for the appliance and select next. 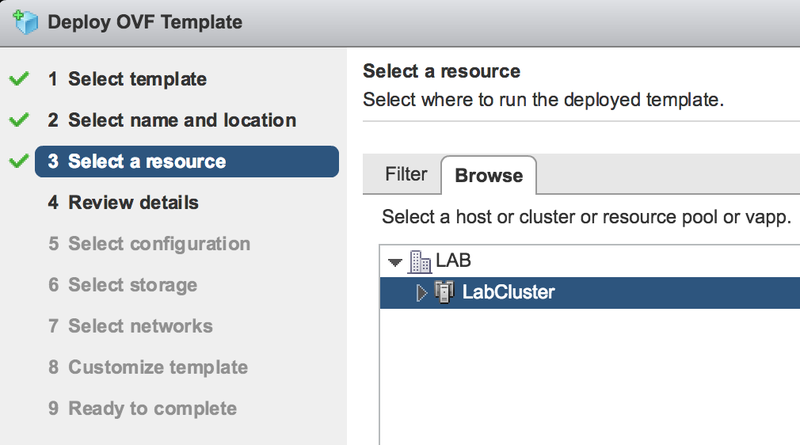 Select a host or cluster for the appliance and select next. Review the details of the deployment and select next. You'll be provided with an option of choosing between 1 to 3 nics for the appliance. For a POC or LAB go with a single nic. For storage, select the storage that screams at you the least and go with Thin provision. Confirm the virtual networks to leverage for the different types of traffic. 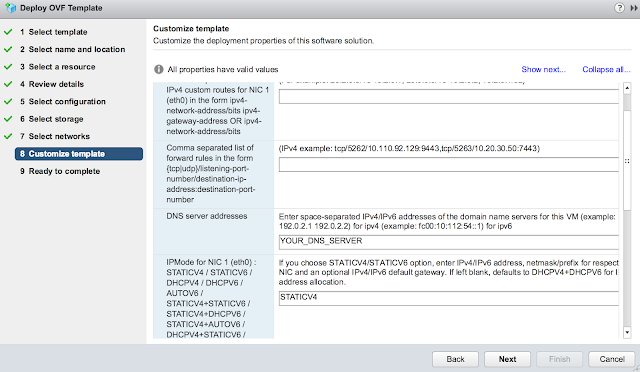 Scroll down further and enter in a default gateway, IP address and subnet mask for the primary nic. Also, enter in hostname for the appliance. Finally, expand the password options section. Enter in passwords for the admin account and root account. Confirm all your options and select finish. Power on your VM once the deployment's complete. 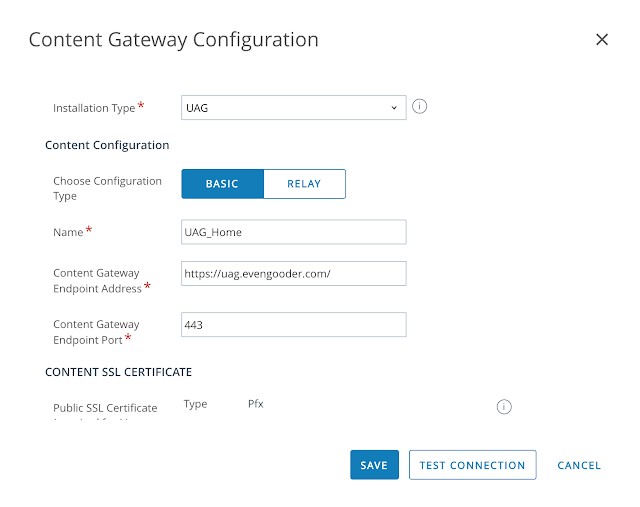 After deploying UAG successfully, the next step is to enable and configure the Content Gateway. Log into the appliance over the web interface then, under Edge Service Settings, select the gear icon for Content Gateway Settings. For the, "API Server URL," enter in the console URL for your Workspace One UEM instance. For the, "API Server Username," and, "API Server Password," provide the credentials of an admin user for your Workspace One UEM environment. 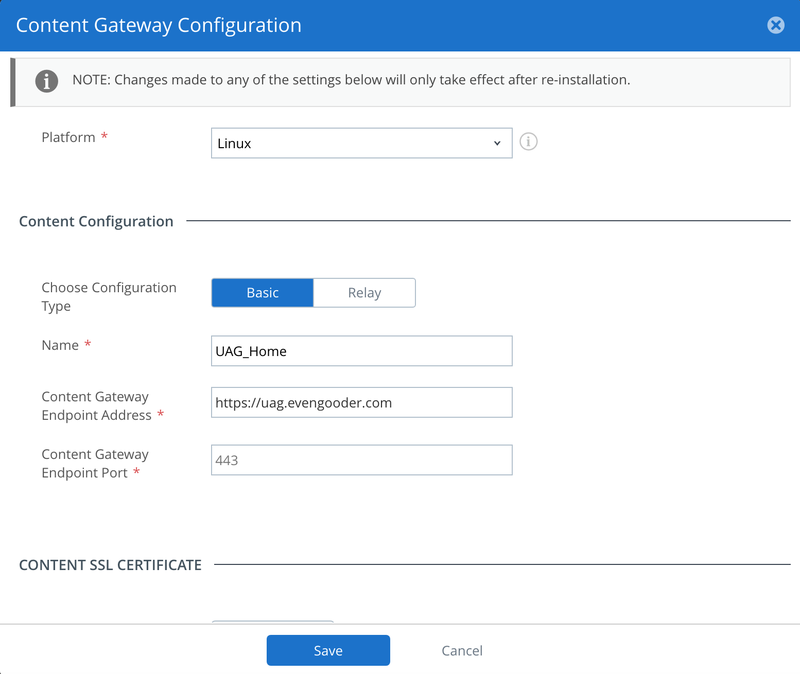 For the, "Content Gateway Hostname," use the hostname you entered in earlier as a Content Gateway Endpoint Address in the Content Gateway configuration wizard . Finally, enter in the GUID that was created for your node upon completion of the Content Gateway configuration wizard. After about 30 seconds you'll see if the settings have been successfully implemented by the presence of a green radial button. Now, to test the connection from Workspace One UEM to the UAG appliance, in the Workspace One UEM console navigate back to Content Gateway under Enterprise Integration. Click on, "Test Connection." Next, we add the CIFS share as an admin repository. 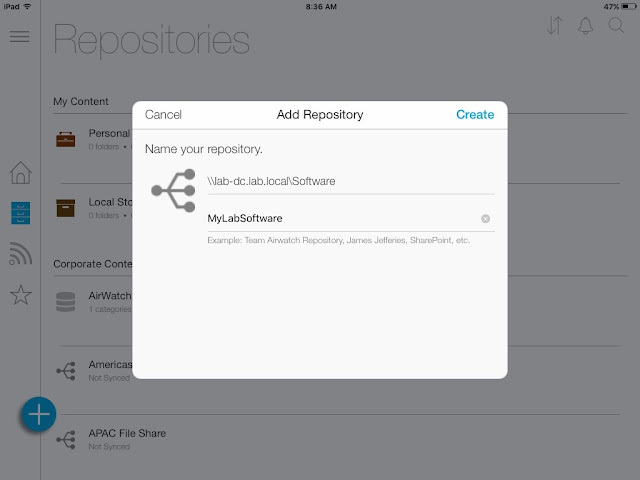 Navigate to Content --> Repositories --> Admin Repositories. Click the Add button. Give it a descriptive name and select, "Network Share," as the Type. Enter in the UNC path to the CIFS share as a link. 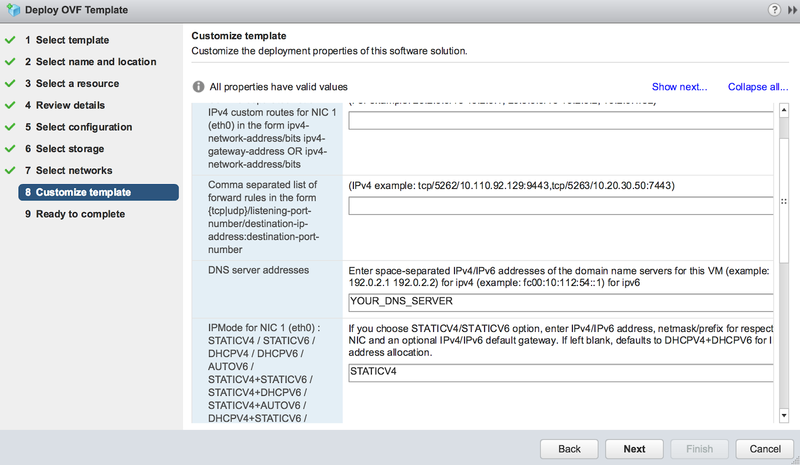 Be sure to check the box for, "Access via Content Gateway," and choose the node you've just created. Under security, place a check box next to, "Allow Edit," and then select save. Further, here's some official guidance on the creation of an admin repository. Go to Apps and Books --> Applications --> Native. Click on add application. 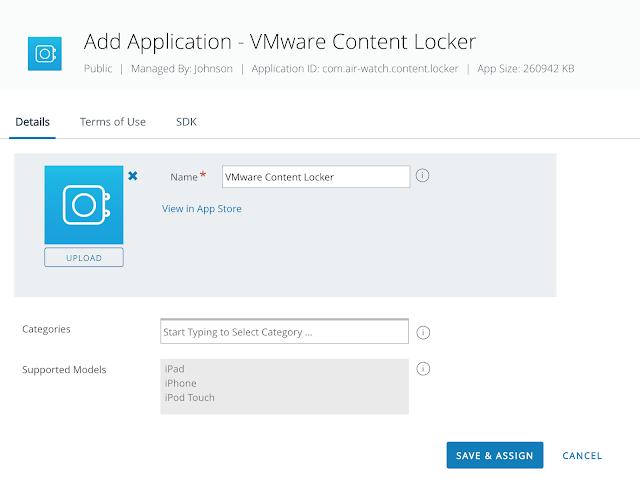 Choose Apple iOS as the platform, then do a search against, "content locker." Click Save and Assign. Click on the Add Assignment option. Select an appropriate assignment group and go with Auto for the delivery method. 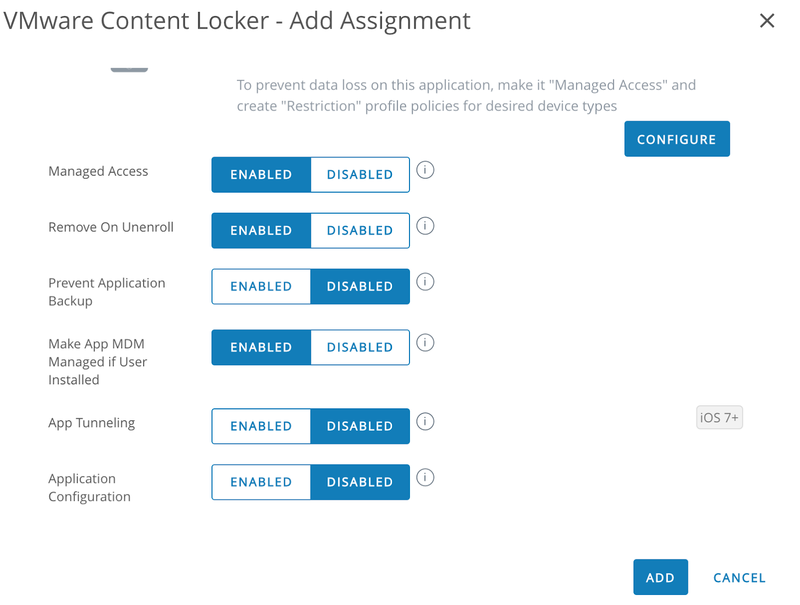 Go ahead and enable "Make App MDM managed if User Installed,"
Save and publish the assignment. Now Content Locker will be pushed out to your assigned devices when they check in. 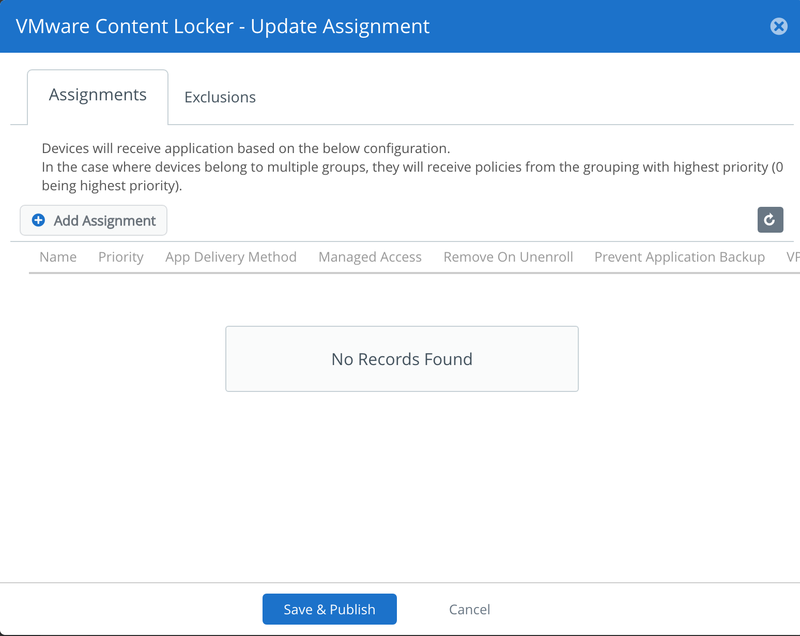 Launch Content Locker. Click on the + icon at bottom left corner of the app. 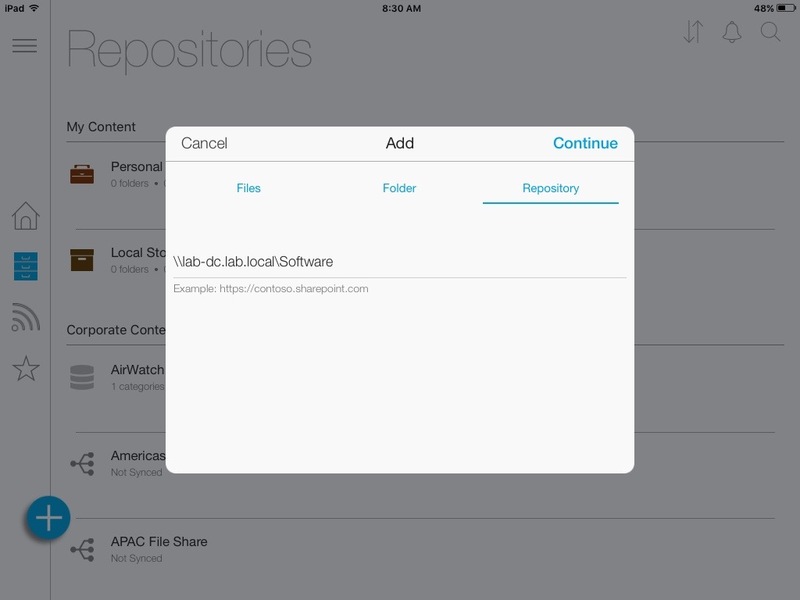 Now add the UNC path for the repository you just created. You'll be get prompted for a friendly name to give it. 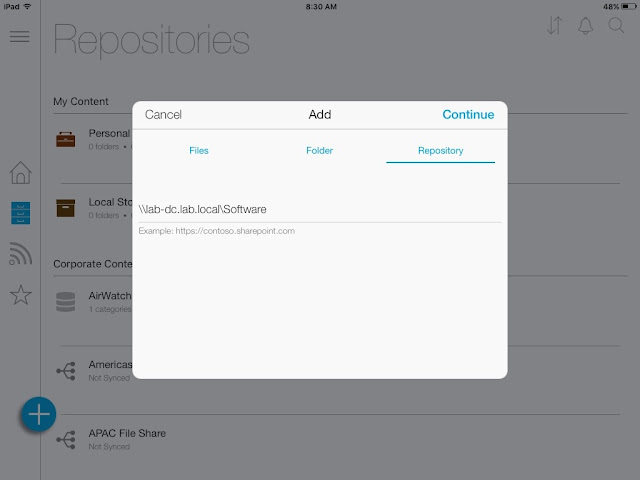 Now the repository will be available from within Content Locker. Tap on the repository and you'll be able to traverse your traditional Windows share, download and upload content. 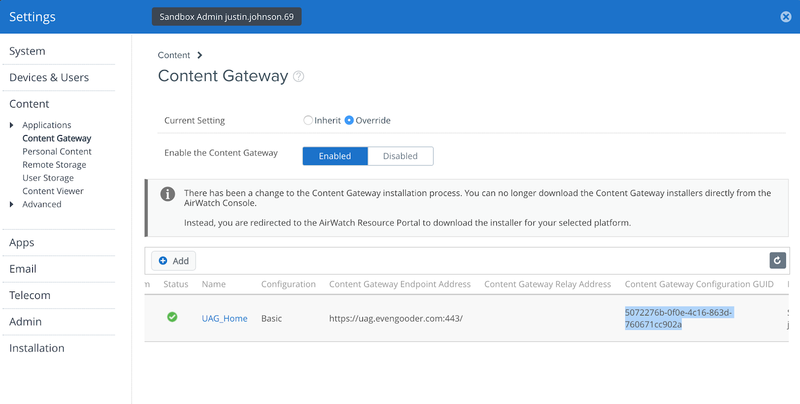 I am deploying UAG with Content Locker and when i try to setup the content gateway it seemed that they are not saved the config. My setup is on-premise and i supossed that the API Server is my Device Service, not the Console. I will going to put the console as API an view if these result. Thanks your for the information. 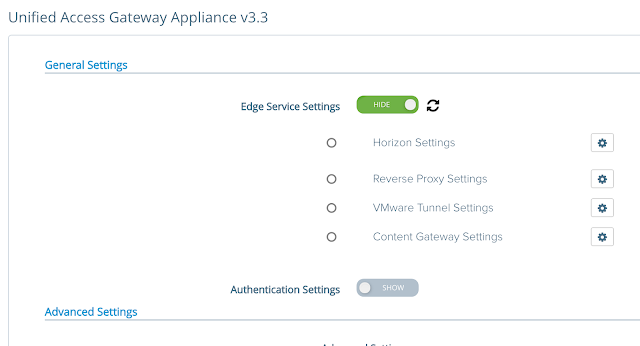 Christian, when edge services on a UAG appliance aren't configured correctly, the settings don't stick and about a minute after enter in the configurations the edge service stops. 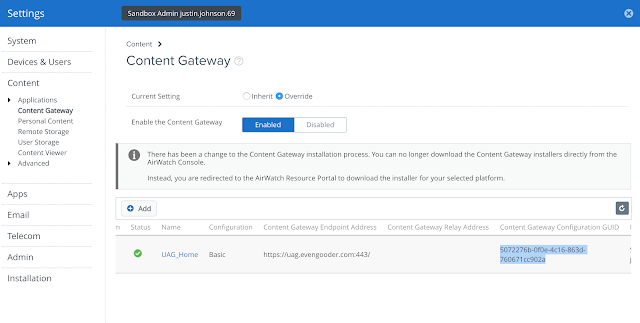 So if you have an incorrect parameter in your config, or don't have connectivity to your API server or AirWatch Cloud Messaging Server, it can cause the content gateway to appear disabled. Thanks Justin, thats right, now is work. Hi Justin, one question please, it is posible apply watermark in Content Locker for Windows 10? For iOS and Android i have not problem but in Windows 10 is not working.